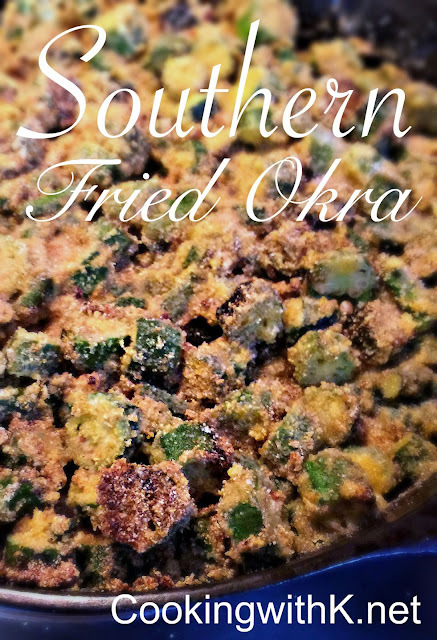 Southern Fried Okra, a simple Southern classic, okra dredged in self-rising cornmeal, then fried until golden. 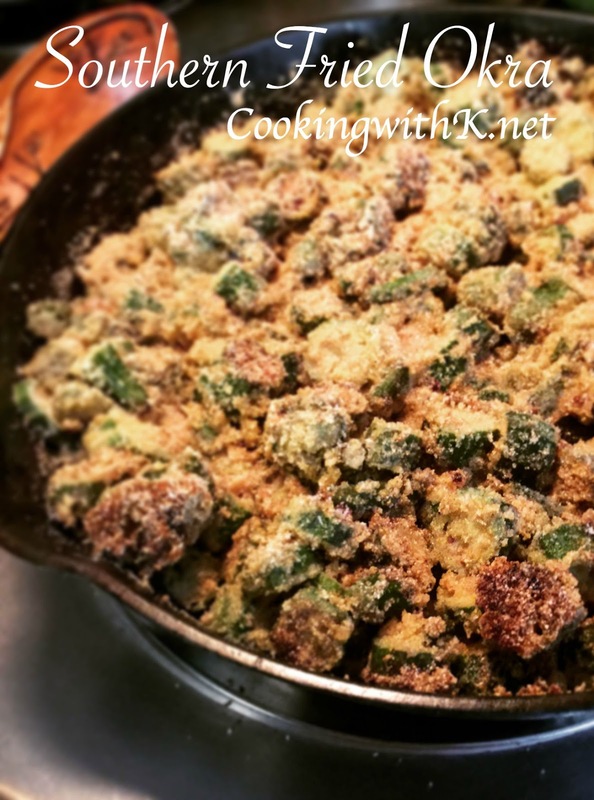 Want to know the simple secret to keeping okra crisp on the outside while tender on the inside? My Mother was an expert at Pan Frying Okra. She could fry it crispy-on-the-outside, almost caramelized shell and at the same time very tender inside. Her method of pan frying the okra was in the fat she fried it in. She used melted shortening and bacon grease. If you are not a fan of shortening and bacon grease (horas), then vegetable oil is fine. One rule she did have was not to salt the okra until after frying, because it makes the okra loose too much of the moisture while it is frying and will make it tough. Her secret to keeping the okra tender on the inside and crispy on the outside. 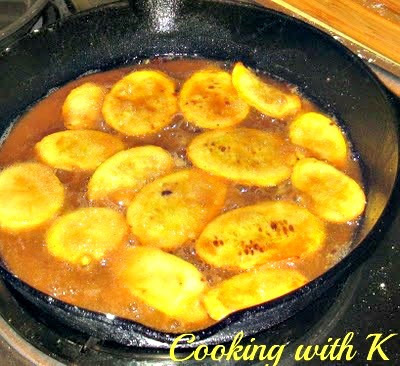 I must say growing up; this was one of my all-time favorite dishes that my Mother cooked for us. She always cooked okra in a cast-iron skillet, and always served it with fresh peas, onions quartered, and Chow Chow (southern relish). When I was a girl growing up in the '60, we ate many a meal with just fresh vegetables out of the garden with a pan of cornbread to go with it, calling it a meal. That is the way we ate this pan of okra. I made a pan of cornbread along with a pot of peas and fried okra. Simple.... Scrumptious! Preheat a large iron skillet over medium heat with shortening or oil. In a bowl add okra, sprinkle corn meal on top; toss to coat. Add the okra all at once to the prepared skillet and fry until golden brown on 1 side, approximately 6 to 7 minutes. Do not disturb until the bottom is golden brown. Turn the okra with a spatula and do not disturb until the majority of the other side is golden brown as well, approximately 3 to 4 minutes. Now stir occasionally until all of the okra is golden on all sides, approximately another 3 to 4 minutes. Remove the okra from the pan with a slotted spoon or spatula to a sheet pan lined with a paper towel. Well now that I've tried okra in soup and know that I like it, I'm anxious to try it in other ways. Hubby says he's had it fried when he lived down south and he loved it so I'm going to give this one a go! Your skillet of okra looked like my mother's. She always fixed corn bread and fried potatoes with hers. I was born in the mid-50s (in Oklahoma) and lots of your things look pleasantly familiar. Good to visit such a nice, Christian blog. This is the way my family always cooked it. The recipe is spot on and I think one BIG important part of it coming out right is to use a cast iron skillet. I had it for dinner last night. The only think I do differently is drain it on a folded paper towel. YUM! This is the best recipe I've seen for the way my mama and grandmothers cooked it. I do believe the secret is the cast iron skillet. The only things I do differently are using corn meal mix instead of cornmeal and draining the okra on paper towels instead of a rack. It's delicious. Had it for dinner last night. YUM! We LOVE fried okra. We live in North GA and my husband is still happy with just veggies and corn bread. Hope to have okra soon in the garden. Going to cook the first mess of green beans today. With corn bread of course. My mom was from Joplin and she made fried okra as a treat for us. My husband and son are converts now. I can't wait for okra to show up at the farmers market! Oh my goodness......you just took me back to my Grandmother's kitchen table. She didn't have a dining room! It's Sunday so we got to have fried chicken, fried okra, sliced tomatoes, cucumber and onions in vinegar (that's what we called it) and "sad" string beans seasoned with bacon grease. I know this may not sound too healthy, however, in the day we thought we had died and gone to food heaven. Oh yes, we had CORN BREAD from scratch in an iron skillet!! You sure took me back...sand so many thanks for doing so! Thank you for stopping by and sharing your sweet grandmother's memories. Welcome to CWK...stop back by soon! You really can't beat good, fried okra. Great recipe! Thank you for stopping by Dan!